Focusing on mobile continues to pay off for Facebook Inc.: the company’s mobile ad revenue reached $5.2 billion USD during the last quarter, accounting for 84 per cent of overall ad revenue, COO Sheryl Sandberg revealed during the company’s Q2 earnings call on July 27. It’s paying off for businesses too, with the cost of a high-quality lead 9.3 times lower on Facebook than other online media, she said. 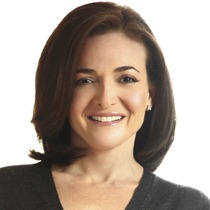 Facebook COO Sheryl Sandberg attributes Facebook’s growth in ad revenue to the company’s increased focus on mobile. In total, the Menlo Park, Calif. social media giant’s quarterly advertising revenue rose by 63 per cent to $6.2 billion, while overall revenue grew by 59 per cent YoY to $6.4 billion USD, a gain Sandberg attributed to both the company’s increased focus on mobile, and its efforts to create new ways for businesses to reach their customers through Facebook. As part of its apparent strategy to be known as much for its ability to connect businesses with their customers as for its ability to connect acquaintances, Facebook’s operating staff is now focusing on three priorities, Sandberg said: further capitalizing on the consumer shift to mobile, increasing the number of marketers using its ad products, and making Facebook ads more relevant and effective. Regarding the first goal, Facebook staff have helped marketers capitalize on the distinctive viewing habits of mobile users, Sandberg said, by giving them the means to create videos that grab attention in seconds without sound – Sour Patch Kids Gum, for example, targeted teens interested in non-chocolate candy with 10-second videos that led to boosted sales. To increase the number of marketers using its ad products, the company has made a concerted effort to make it easier for business owners to manage their Facebook pages from a mobile device. So far, it’s working: more than 85 per cent of active business pages are accessed on mobile devices, and 40 per cent of active advertisers have used their device to create a Facebook ad, Sandberg said. As for making ads more effective, Sandberg mentioned Facebook’s “lead ads” feature, introduced last year, which allows users to easily fill out lead forms (which can take the form of coupons, newsletter requests, contest entries, etc.) on their mobile devices – thereby adding themselves to a company’s contact list. Businesses have also found luck with dynamic ads, she said, which allow advertisers to upload their product catalogs and target people with specific products in real-time. Elsewhere, Facebook’s worldwide user base continues to grow: the company added 200 million monthly users over the past year, for a worldwide total of 1.7 billion, with 1.1 billion people using it every day. Meanwhile, Instagram has grown to more than 300 million daily and 500 million monthly users, while more than 1 billion people are now using Messenger. Our thanks to investment research platform Seeking Alpha for the transcriptions from Facebook’s July 27 Q2 earnings call.